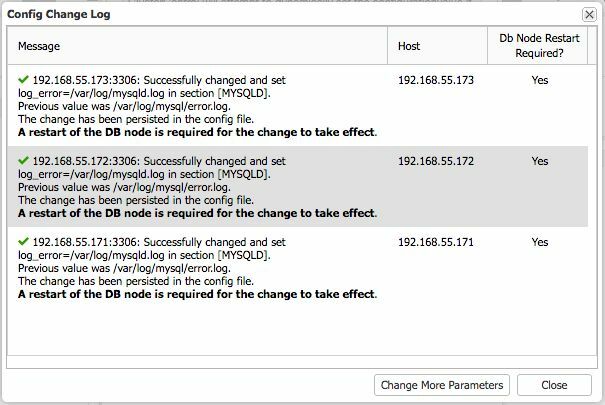 In a previous blog, we looked at the efficiency gains when automating the deployment of a Galera cluster for MySQL. In this post, we are going to dive into cluster management. Should we manage our cluster manually, or does it make sense to automate the procedures ? What do we gain with automation? Let’s take a look at the different steps involved in some of the above, and see if it would make sense to automate them. Restarting MySQL service is simple in a standalone setup but in a Galera cluster, performing a rolling restart might be tricky in some ways. You have to ensure the node reaches primary state before proceeding to the next node. In some occasions, a node restart could bring chaos as described in details in this blog post. In ClusterControl, you can achieve this in two ways, using “Rolling Restart” function or restart the node, one node at a time, under the Nodes tab. To perform a rolling restart, go to ClusterControl -> Manage -> Upgrades -> Rolling Restart -> Proceed. Tuning the database configuration is a continuous process. There are plenty of configuration variables available for instance in MySQL and it’s not trivial to remember which ones are dynamic variables (that you can change on runtime without restart) or non-dynamic variable (where MySQL restart is required). Acknowledging this in advance is important so we are aware of the next step to take - so our new configuration is loaded correctly. 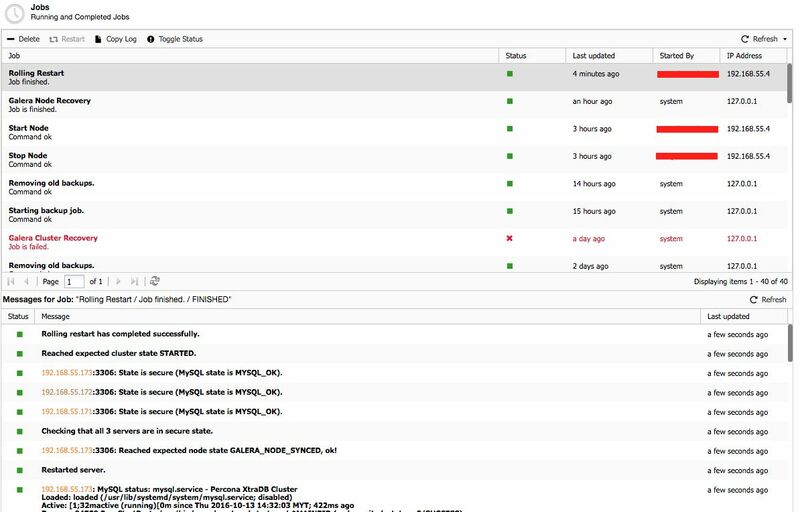 Go to ClusterControl -> Manage -> Configuration -> Change Parameters. From the log window above, we should perform a rolling for the change to take effect. Next, perform the rolling restart as described in the first section, Nodes Management. Create the backup destination path. Experiment with backup commands (this is the most time consuming process). Create a cron job for backup. Run the housekeeping command to test it it works. Create a cron job for backup housekeeping. Alternatively, it is possible to schedule backups via ClusterControl. Backup files can be stored on the DB node where the backup is taken, or it can be streamed to the ClusterControl node so it does not take extra space on the database server. Other interesting options are parallel copy threads, throttle rate, network streaming throttle rate, as well as desync of the target node when the backup is running. 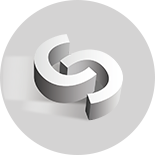 Older backups are also automatically purged based on a configurable backup rotation interval. 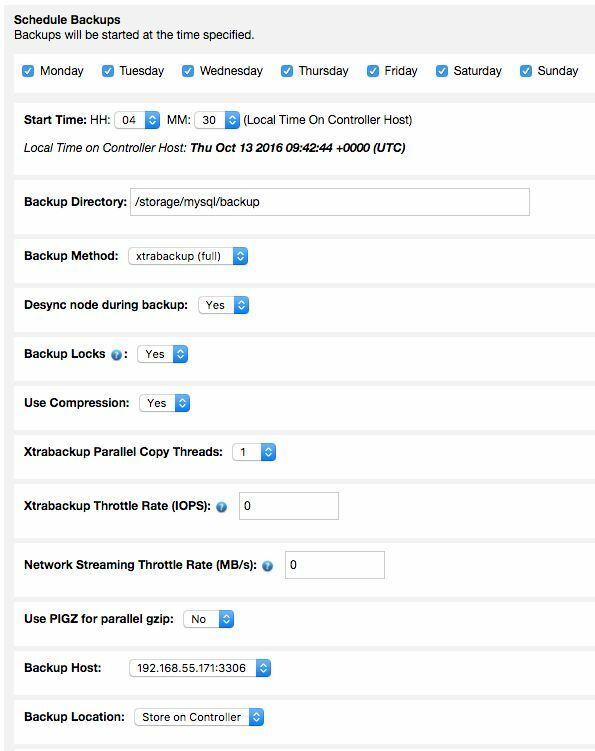 Backup sets include a full backup and related incremental backups, restoration of a backup set can also be performed from ClusterControl. Finally, if the scheduled Galera node is down for maintenance or unavailable for some reason, it is possible to configure ClusterControl so that it schedules the backup on the next available node. 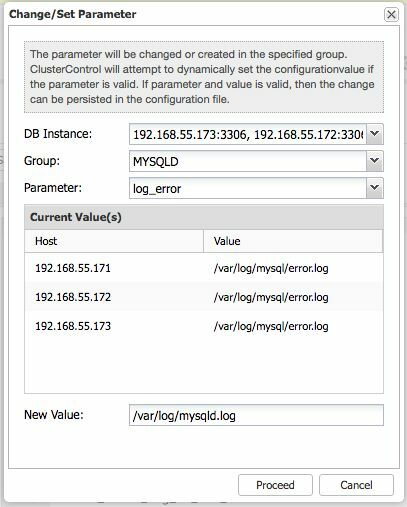 A common misconception when adding users to Galera cluster is to create them using “INSERT INTO mysql.user” statement, which is plain wrong. The suggested way is to use DDL statements such as GRANT or CREATE USER to create users, since the table mysql.user is a MyISAM table (Galera replicates DDL statement regardless of the storage engine). 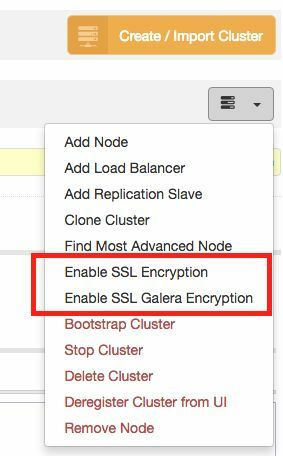 In this last chapter, we are going to touch upon security and encryption for Galera Cluster. 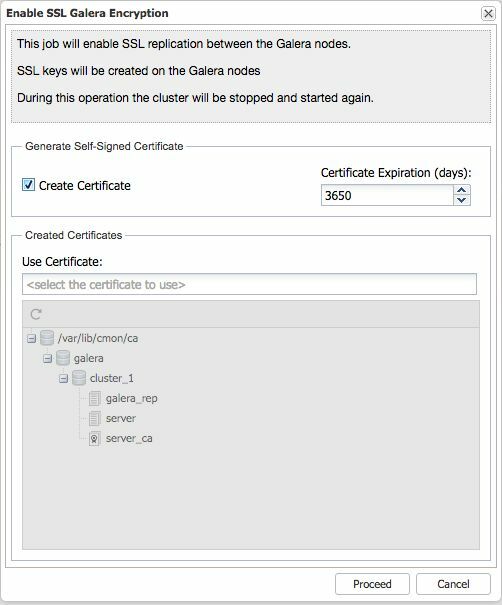 ClusterControl supports enabling SSL encryption (client-server encryption) as well as encryption of replication traffic between the Galera nodes. This is especially important when deploying on public clouds, or across different data centers. That’s it. 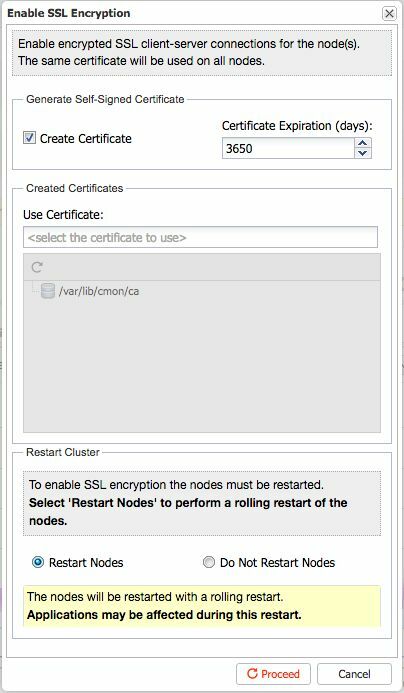 Setting up a cluster with full SSL encryption is not a difficult job anymore with ClusterControl. 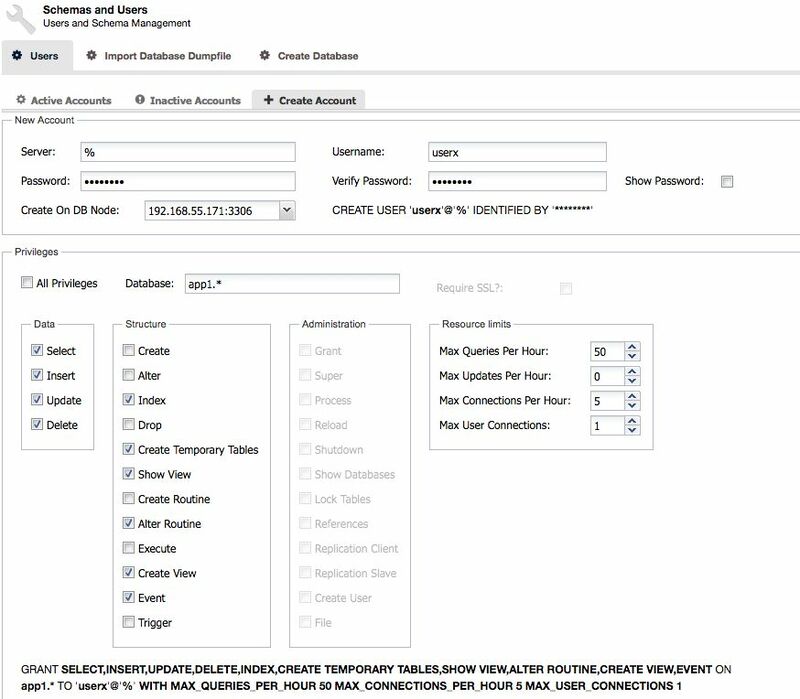 The above is a subset of management functionality that can be automated via ClusterControl, you are very welcome to give it a try and let us know what you think.